People’s desire to understand the environments in which they live is a natural one. People spend most of their time in spaces and structures designed, built, and managed by humans, and it is estimated that people in developed countries now spend 90 percent of their lives indoors. As people move from homes to workplaces, traveling in cars and on transit systems, microorganisms are continually with and around them. These microorganisms reside outdoors in soil and water and coexist indoors where people live and work. They are found in and on pets, plants, and rodents; in water; in dirt tracked indoors on shoes; and in the air that enters buildings. Microorganisms also live on human skin and in systems such as the digestive tract, and the human-associated microbes that are shed, along with the human behaviors that affect their transport and removal, make significant contributions to the diversity of the indoor microbiome. What microorganisms are people exposed to in these indoor settings? What factors control their abundance, diversity, persistence, and other community characteristics? What effects could these organisms have on the health of human occupants and on such other factors as degradation of building materials? The characteristics of “healthy” indoor environments cannot yet be defined, nor do microbial, clinical, and building researchers yet understand how to modify features of indoor environments—such as building ventilation systems and the chemistry of building materials—in ways that would have predictable impacts on microbial communities to promote health and prevent disease. The factors that affect the environments within buildings, the ways in which building characteristics influence the composition and function of indoor microbial communities, and the ways in which these microbial communities relate to human health and well-being are extraordinarily complex and can be explored only as a dynamic, interconnected ecosystem by engaging the fields of microbial biology and ecology, chemistry, building science, and human physiology. 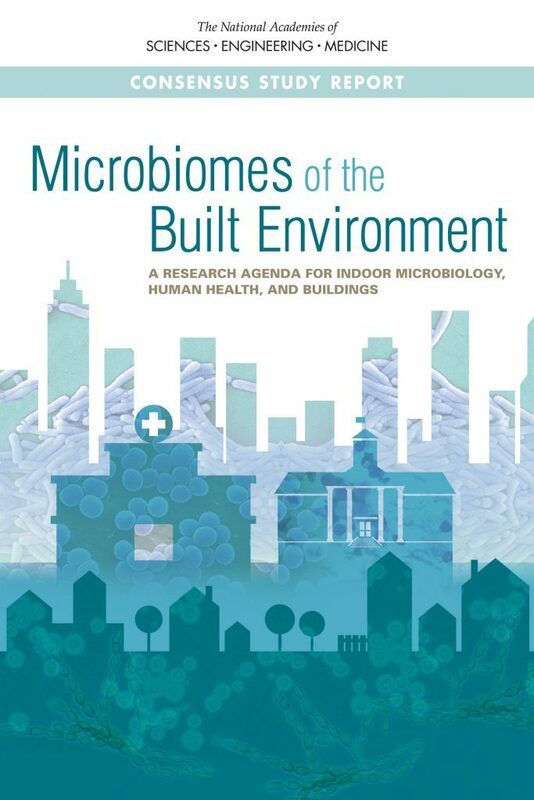 This Consensus Study Report reviews what is known about the intersection of these disciplines, and how new tools may facilitate advances in understanding the ecosystem of built environments, indoor microbiomes, and effects on human health and well-being. 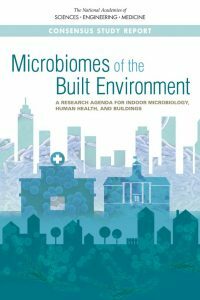 The report provides a vision of a future in which indoor microbial communities are better understood, and built environments can be designed and operated to improve human health. To advance this vision, the report offers a research agenda to generate the information needed so that stakeholders with an interest in understanding the impacts of built environments will be able to make more informed decisions. How do indoor microbes differ from outdoor microbes?